I seem to always run in to the same problem when I’m in South Haven. I just never have enough time to sit down and enjoy some of the great restaurants the city has to offer. My co-worker and I headed out to the lake shore last week for an assignment. We spent a couple hours completing our task but then had to get back to Kalamazoo. I needed to make a stop near the pavilion downtown before we got on the road which got me thinking about lunch. I looked across the street and saw one of the few grab and go places in downtown. 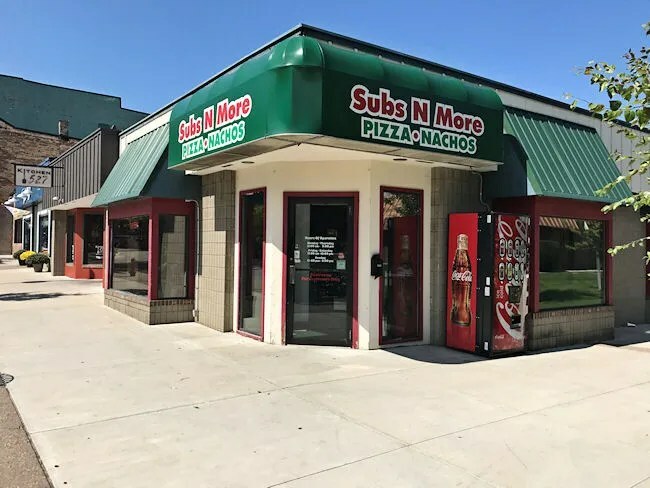 Subs-N-More is on Phoenix Street on the east end of the downtown business district. It’s one of the first stores you see when you’re heading towards South Beach using Phoenix Avenue right next to the traffic calming sign at the entrance to downtown. The business is a standalone shop that’s connected to the rest of the downtown buildings by proximity. There is parking all along Phoenix Street if you can find a spot but there’s also a couple of municipal lots within a couple blocks walk from the store. 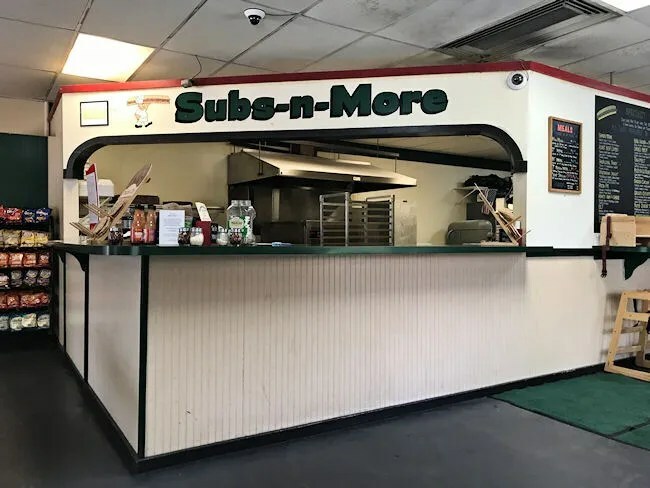 Subs-N-More is set up as a counter service restaurant. 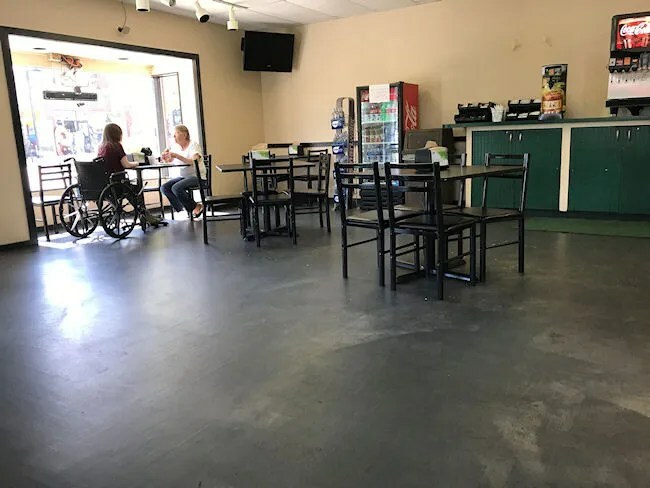 When you walk in to the building, you immediately see a big counter in the middle of the space that separates the dining room from the kitchen. 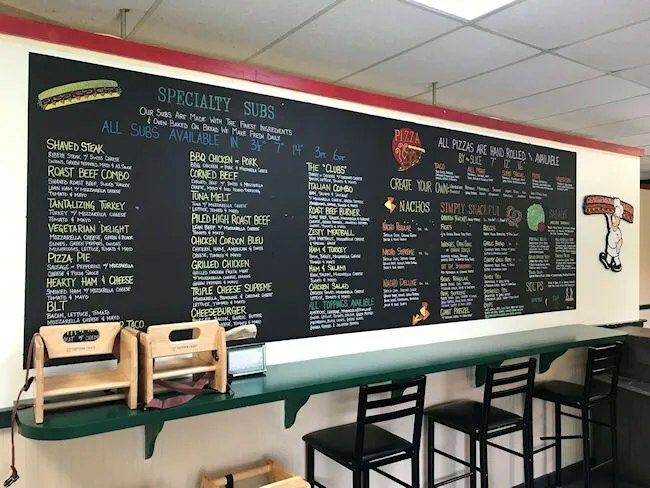 The menu is written out on a chalkboard off to the side of the counter. It’s a rather large menu that consists of a variety of subs, pizzas, nachos, sides and pretty much anything you can cook in a conveyor oven. There is a rather large dining room, but it’s sparsely populated with tables and chairs. The large main area of the dining room looks like it could comfortably hold three times what is there. I stopped in for lunch on a Thursday after Labor Day and while they were busy with a constant line of people, not many were opting to eat inside the restaurant. There’s also more seats along the side of the restaurant that leads to a back entrance. There is a parking lot that is accessible off Quaker Street that leads to this door if you can’t find parking along Phoenix, this is a nice option if you’re just picking something up to go. Again, this area could hold quite a few more tables than it does if there was a need. 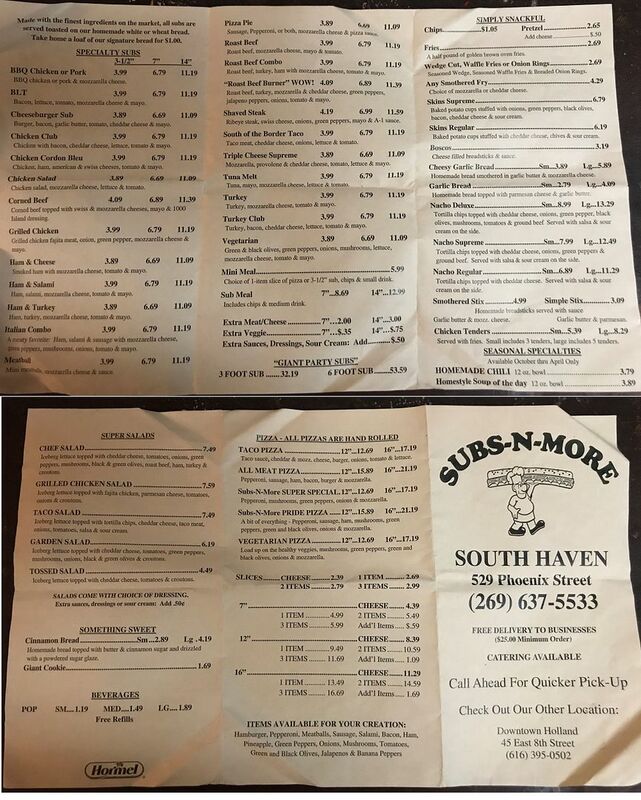 I grabbed a paper menu off the counter and quickly scanned it looking for a sandwich. There were a lot that sounded good until I started reading the ingredients. It seems everything is loaded with veggies and while I like veggies on a sandwich, I prefer the meat to dominate. I saw a few sandwiches come out of the oven and they all looked like they were vegetarian. The sandwiches were piled high with toppings and looked rather large but lettuce played a big part in that. I did find one that sounded good. 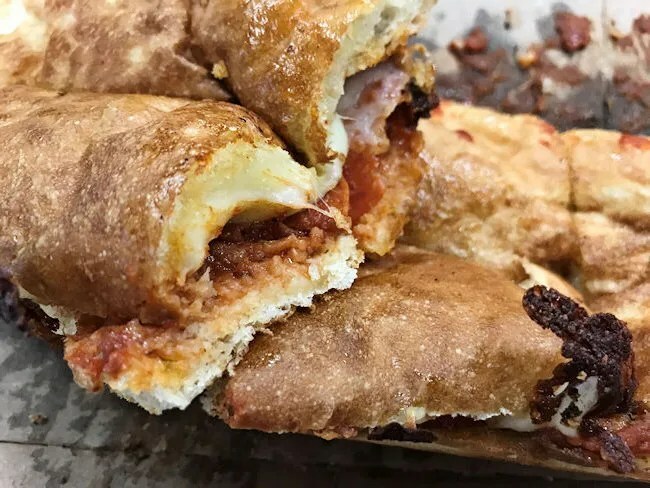 It’s a simple Pizza Pie Sub that comes with marinara sauce, mozzarella cheese and pepperoni and/or sausage. I ordered a 14″ sub with two bottles of Coke from the cooler. The meal set me back about $15 and it took about 15 minutes for my sandwich to be boxed up and handed over to me. I grabbed the box and headed back to the car where my co-worker was waiting. I had to drive back to Kalamazoo before I could eat it because I didn’t want to make a mess in the car. When I opened the box, the first thing I noticed was that it looked a lot like a Mancino’s grinder. 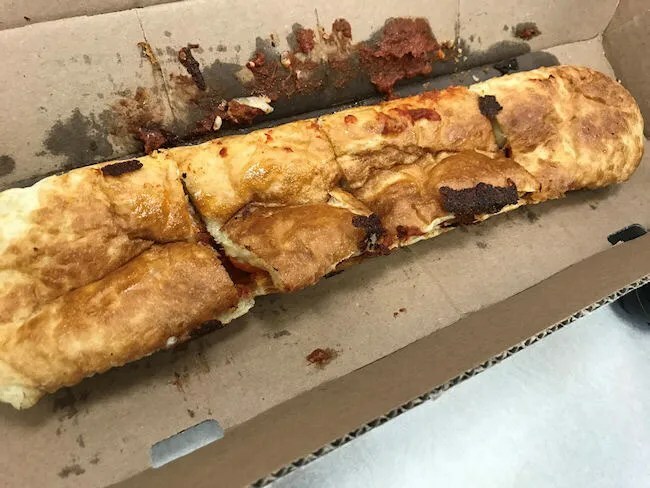 It had the same time of bread and the little burnt edges from the cheese sticking out of the bread and burning on to it while it made it’s way through the oven. The sandwich looked a little thin but that’s because there’s just not much girth to pepperoni and cheese. Despite not looking like much, the sandwich was actually pretty filling. The marinara sauce had a little bit of a kick to it and there were a coupe layers of pepperoni that added a little bit more kick. The sandwich wasn’t quite as good as Mancino’s (which there is also one of in South Haven, but it’s out by the high school). 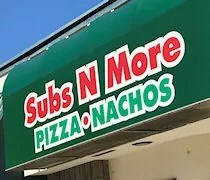 Subs-N-More provides something that there isn’t really a lot of downtown. A quick, counter service option for food. 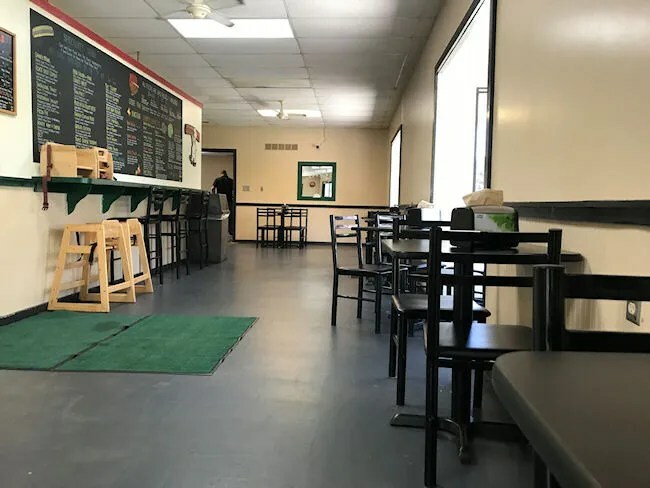 The sandwich, while being similar to Mancino’s, wasn’t quite as good as Mancino’s (which there is also one of in South Haven, but it’s out by the high school). Not everyone has time to sit down and eat after a day at the beach and this place is nice to have as an option on your way out of town.